Butterfinger has released a new ad to promote its “better Butterfinger,” which is now made based on an improved recipe with high-quality jumbo peanuts. The 60-second spot opens with a woman handing a Butterfinger candy bar to a friend, telling him it’s a “better Butterfinger”. In a totally different place – a mysterious lab in a desert area – a sleeping alien hears the “better Butterfinger” part and wakes up, eager to get his hands on the sweet treat. He leaves the laboratory, takes an old car covered in dust and speeds down to the city, giving a ride, on the way, to a guy selling T-shirts on the side of the road. After an out-of-this-world parking maneuver, the alien gets out of the car and, grabbing the Butterfinger from the man’s hands with his paranormal power, says something in his language that is translated as “Nobody lays a finger on by better Butterfinger!”. 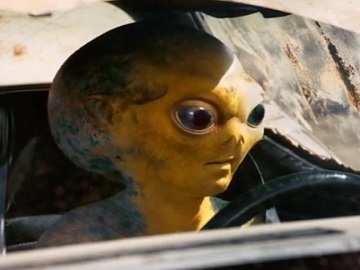 The commercial, which communicates that this improved recipe ensures “better crispety, crunchety, and peanut-buttery,” ends with the voiceover adding the tagline “Now Better Than Ever”, while the alien is seen driving away. The soundtrack music is the “Rumble and Sway” by the British singer/songwriter Jamie N Commons, from his 2016 “Rumble and Sway” EP. The TV spot will be featured across multiple cable and network channels and programming. According to the brand, the better Butterfinger, which is now available at retailers across the country, is made with “carefully-selected U.S. grown peanuts and a rich chocolatey coating,” and features a double-layer, higher-quality packaging material.